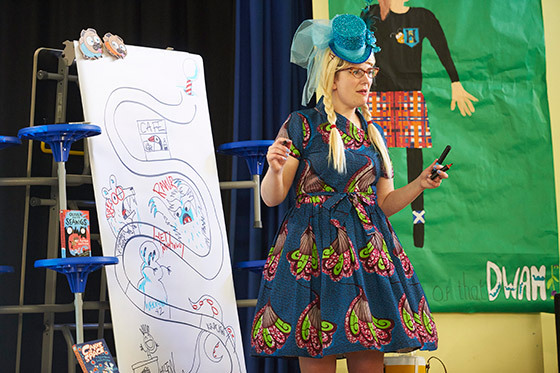 In May 2016 the Scottish Friendly Children’s Book Tour visited primary schools in The Highlands with the amazing author and illustrator Sarah McIntyre. 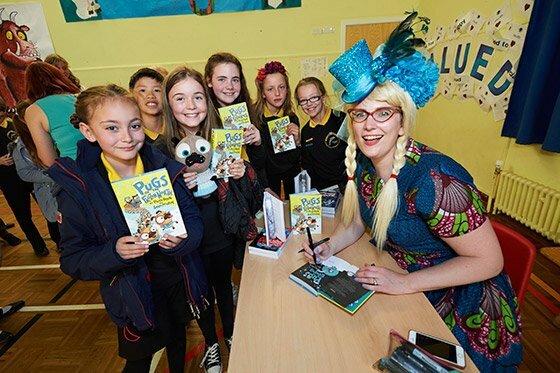 Over the course of an action-packed week Sarah, always wearing an amazing costume visited 10 primary schools, taking more than 1800 pupils on a great adventure into the madcap world of her latest book Pugs of the Frozen North. She read excerpts from the book and shared her creative storytelling journey in the form of an interactive, illustrated board game, before pupils had a go at drawing their own Pug characters to take part in the race. The sessions were lively and inspiring, fuelling children’s imaginations and channelling their ideas in a fun way. 1. Which author or fictional character would you like to have dinner with? A. ALL the pugs from Pugs of the Frozen North. I mean, who wouldn’t want to cuddle 66 pugs all at once? I might need the Scottish Book Trust team around just to make sure things don’t get out of hand. 2. Which book should every child read? A. There’s no such book! Every person is different; one person will get totally absorbed in a comic book, another will practically memorise a car magazine and another will decide Pride & Prejudice is the best thing ever. 3. What would your dream job be if you weren’t an author? A. I’d love to spend a year designing gloriously flamboyant hats. Maybe do an apprenticeship with Philip Treacy. A. I own a gorgeous linocut print by Chris Wormell. And all the illustrations to Philip Reeve’s Traction City book. And a knitted Pug and Sea Monkey and Jampire that are all super-cute. Also my laptop; usually it stores all my latest artwork. A. Possibly Dame Edna? Or Grayson Perry or Julian Clary if Edna’s otherwise engaged. 6. What is your fondest childhood memory? A. Riding a very fat pony named Bluebell, owned by a friend of my mother’s. Bluebell actually hated my guts and threw me over her head at any chance, but I convinced myself we were inseparable and got a big thrill at doing battle with her. Another huge thing was a family trip to Scotland when I was 12. Stirling Castle was the first castle I ever visited and as a little American kid from Seattle, I was totally gobsmacked. My little sister was a bit young to appreciate the trip; all she wanted to do was go to the Netherlee supermarket in Glasgow to stock up on Penguin bars. 7. If you could go back in time, what year, period or event would you choose? A. Can I go forward? I’d like to visit the world of interstellar trains in Philip Reeve’s book Railhead. I hope the future turns out like that. 8. Which book has left the greatest impression on you? A. My top two books growing up were probably Watership Down by Richard Adams and the Calvin & Hobbes comic anthologies by Bill Watterson. They read just as well to me as a grownup, they’re genius, and no one draws better than Bill. 9. If you could give one piece of advice to aspiring authors what would it be? A. Don’t just draw and write, also practicing making actual books. When you make a book, you learn how books work, and finishing a project is a great habit to get into. The difference between an aspriring author and an actual author is an actual author finishes stuff. Print up little versions of your books and perhaps sell or swap them at comics festivals or on the playground with your friends. They don’t have to be weighty epic novels; a tiny 8-page comic can be awesome. Little books make great gifts and business cards, too. 10. What would be your first purchase if you won the lottery? A. I’d want to donate more money to helping my author colleague Tommy Donbavand, who’s fighting cancer right now. Being a writer or illustrator doesn’t guarantee being rich, even if we’re successful; Tommy could really use some help to make ends meet while he can’t do as much work as usual. You can find out about his progress on the remarkable blog he’s keeping: www.tommyvcancer.com (People can donate money either as a lump sum via Paypal or small monthly increments via Patreon.) He’s a lovely guy with a big heart.